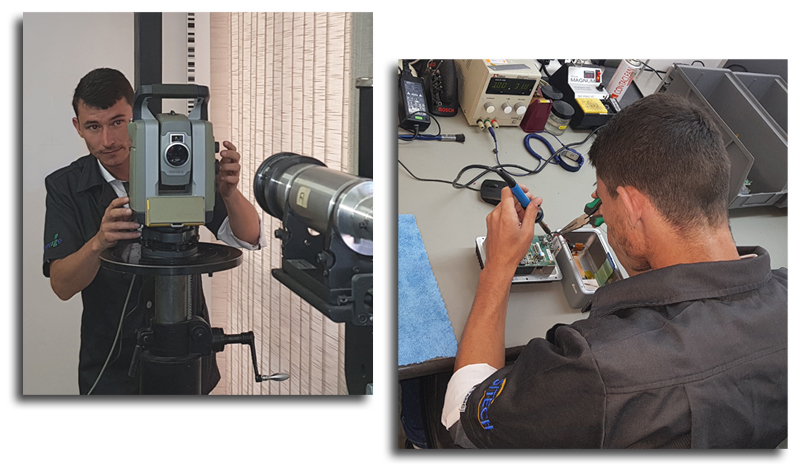 The OPTRON Service Centre in Centurion is equipped to repair all Trimble, Nikon and Spectra geospatial products. The facility is Service Level III certified (the highest achievable level for a Trimble Service Provider) with the necessary infrastructure and factory trained technicians to ensure quality service and total customer satisfaction. We are committed to reducing down-time and maximizing return on investment. From the moment we receive your equipment until you receive get it back, there is quality in everything that we do. Outstanding workmanship and meticulous attention to detail goes into each step of the repair process, as one would expect from a world-class Service Provider..
We are serious about Service and understand that your equipment is a business tool. Our job is to keep you working. The ability to successfully complete the sales, support, service cycle is paramount to our operations. Customers are the heart of our business and we intend to leave them satisfied during the service experience. Our suppliers invest heavily in research, development and safety. They implement stringent quality control standards to ensure that your equipment has replacement parts that are reliable and durable. To ensure minimum down-time, we keep a healthy inventory of genuine Trimble parts. Our factory-trained technicians are highly skilled and know your equipment inside-and-out. They work with the latest diagnostic tools and have a wealth of experience. All technicians are members of the Trimble PSP (Preferred Service Provider) alliance. This alliance sets industry standards and best practices, ensuring that a device is always serviced or repaired to manufacturer’s specifications. * We offer free shipping to our Service Centre in Centurion, for equipment delivered to OPTRON’s Cape Town and Durban branch offices.